A San Diego Probate Cost? 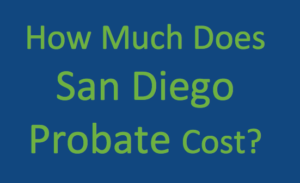 Frequently calls come in from San Diego probate executors and administrators, and one of their most common question is: how much will this San Diego probate cost? This is a great time to give basic answers to the question, and links so that you can get updated and accurate information. San Diego probate attorneys have share with me that a San Diego executor or administrator can expect between $1,500 and $2,500 in court and miscellaneous costs. In addition, California probate code section 10810-10814 sets the maximum fees that San Diego probate attorneys, executors and administrators (personal representative or PR) can charge for the managing of the San Diego probate . The PR is entitled to statutory fees payment, but depending on the circumstances, occasionally the PR chooses to not charge the fees ie. the PR is also the beneficiary. The PR needs to understand that the statutory fees can potentially be considered taxable income. In the case that the PR is also the beneficiary, receiving the inheritance may be a better option because the inheritance would potentially be non-taxable. My best recommendation is that the decision be made with a trusted tax professional and legal counsel. In California, for example, a San Diego executor can charge 4% of the first $100,000 of an estate’s value; for a $1 million estate, the fee is $23,000. The value of the estate is its gross appraised value—for purposes of calculating the fee, debts are not subtracted. What this means, to you, is that if the home sells for $800,000, but the decedent had a $600,000 mortgage, the estate would receive less than $200,000, but the PR and San Diego probate attorney would receive calculated payment based on the full $800,000. Remember that the statutory fees can only be paid once the court has ordered them paid from the estate. This typically occurs as part of the final accounting at the end of the probate process. Which means that the San Diego PR and San Diego probate attorney will be compensated for their months of work typically a year after they begin the process. PreviousPrevious post:Do I Need a Tax Identification Number When Selling San Diego Real Estate in Probate or a Trust?NextNext post:I’m A San Diego Trustee, Now What?